Mangere Mountain, from which this photo was taken, is a volcano that erupted about 20,000 years ago. Mangere Lagoon with its central scoria cone is the explosion crater of an earlier eruption (date not available). About 7000 years ago, rising sea levels broke the tuff ring and created the lagoon. During the last 40 or so years of last century, the lagoon served as sludge ponds for the sewage treatment plant. This has ended, and the lagoon restored. A pleasant walkway leads right around it (connected to the Watercare coastal walkway); a good place to watch wading birds. In the distance to the right of the picture one recognises Manukau Heads (the opening of the Manukau Harbour to the Tasman Sea), with Puketutu Island in front. 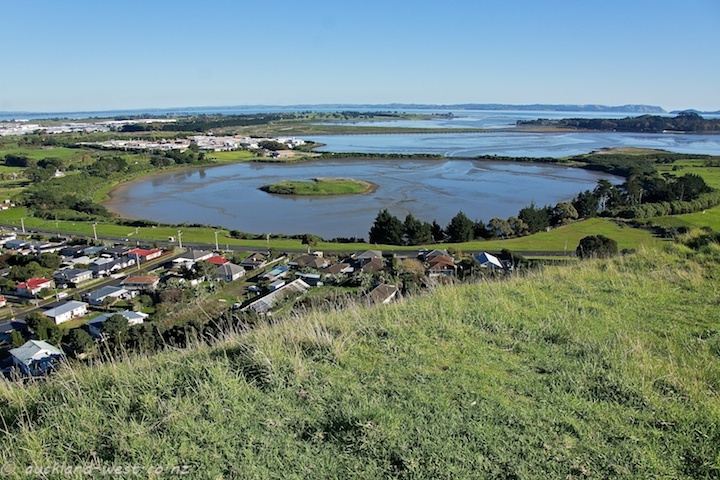 About a year ago, I showed a picture of Mangere Mountain, shot across the lagoon.